Coloration: Generally a turquoise blue coloration with dots all over the body with a black dot at the base of the tail. 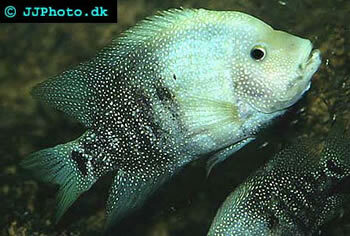 When breeding three bars will color black at the rear fish, as well as, the belly and mouth area. Green and red variations are also found in the industry. Temperament: Moderately Aggressive. Dominantly Aggressive when breeding. Breeding: Egglayer, slight ph swings, live feeding, and slight temperature changes can spark this fish which is easily breed in the aquarium. Females are ready to breed around 3-4 inches.